Finalement!! I have a victim/volunteer--and am super excited to present today's maquillage du jour: Sparkling, Passionate, Purple Grape on the lovely Selena. 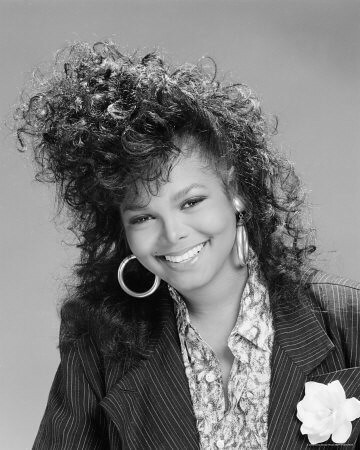 Tell me she isn't channelling a young Janet Jackson here?!! *Foundation and lashes not included. SKIN: Because Selena has some dark spots on her forehead and chin, I showed her a cool concealer trick that I use every day on myself to cover up blemishes, conceal dark spots, and even out the skin tone. Makeup Tip #1--Dark Spots: Take a white eyeliner pencil of a non-sticky consistency (I like Ben Nye eyeliner in White, shown in first pic) and go over your dark spot. It's just like adding white paint to any color--the spot will become lighter but the tone won't change. P. S. I used to be an art major in my past lifetime, so I know what I'm talking about :)) Go over only the major spots, foundation will take care of the rest. Makeup Tip #2--Contouring: Because darker skin absorbs the light rather than reflects it, highlighting and contouring is an essential step for any Glam makeup look. I used a lighter shade concealer down the bridge of her nose, under the eyes and in the inner corners of the eyes. I then applied foundation and contoured the sides of her nose, the temples and the hollows of her cheeks using a powder in a darker shade and the fishy face technique (sucking in the cheeks and following the grooves to the temples). We mixed about 3 different powder foundations to match Selena's caramel complexion with warm (red) undertones and set the makeup with Bare Minerals tinted Mineral Veil . I wanted to keep the skin very matte and focus the color and sparkle only on the eyes and the cheekbones. I used a MAC highlighter to highlight the cheekbones and a purple-ish matte blush just on the outer portion of her cheeks. Taking a duo tone pink-purple shadow on the same brush, I applied it to the center of her lid, using the same patting technique. 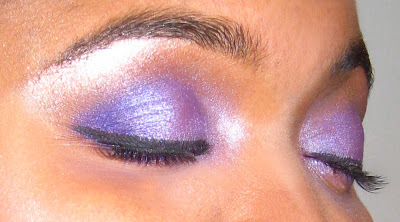 Next, I took a sparkly lavender and applied it to the inner third of the lid as well as the inner corner or the sideways "V-shape" of the eye. With the same brush, using the pointed tip this time, I applied the shadows in the same order, under the bottom lash line. Taking a clean fluffy brush, I cleaned up the harsh edge of the purple shadows and blended out the color just a bit, using windshield wiper motions. Next, I highlighted under the high point of her brow arch and swept the color toward the temple. I used Urban Decay Virgin from the Naked Palette (not shown). To balance the highlight, I extended Selena's eyebrows just a bit, following the direction of her natural brow shape. Her brows are very full, so I concentrated the color only at the ends. Next, I lined the top lash line with a black gel liner and extended the wing toward the outer point of the brow--> Key Makeup Tip for elongating round eyes. Lastly, I lined her bottom waterline with the same gel liner and added half lashes to elongate the eye some more. LIPS: I finished the look with a neutral pink gloss for a subtle hint of color rather than a pop. Selena tends to shy away from pink lip colors, so I had to show her otherwise. I think this particular shade of pink is neither overpowering nor muted and the glossy consistency only plays up the sparkling theme of this makeup. MAQUILLAGE TIP: Whether you are olive, yellow, ivory, caramel, or mocha, every makeup look has the potential to look amazing on you. The key is choosing the right shades and using the proper technique to apply the makeup. 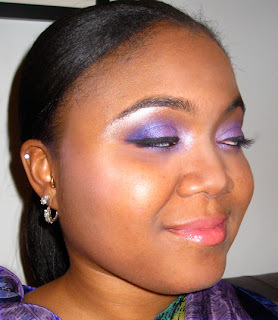 The darker your skin tone, the more color you can get away with, so for purple looks, go for bold shadows like Vibrant Grape and Shimmery Amethyst. If you're lighter, choose colors that won't make you look like you got punched in the eye: Eggplant, Lavender and Lilac are all good options for shadow choices. To see Selena's makeup on me, check out my post Lady Vengeance. 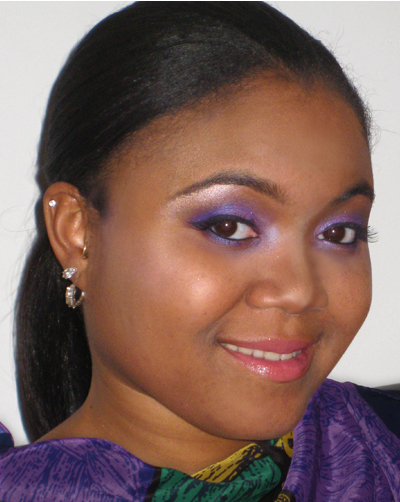 It's not the exact replica by any means, just another take on the purple eyeshadow makeup. That's hot!! I wanna model for youuu!!! Thanks ladies :)) You can model for me any day Anisa!!! Thank you!!! Yes she is, young Janet's got nothing on Selena!!! Her smile is so kind. awww u seriously need to make a living as a make up artist on d side!!!! go to d MAC counter n start applying! ull get more customers that way! SOOO pretty! I've yet to find my perfect shade of purple!